As a woman who has grown to completely accept her bipolar disorder diagnosis, I have done my very best to acquaint my four children with the realities of living with a mental illness. They need to know that my diagnosis doesn’t define me as a person. The same goes for other people living with mental illness. Mental illnesses are frequently inherited, and I would be remiss if I didn’t do everything in my power to prepare them for the results of my potentially inherited genes. I mean, people openly discuss family histories of high blood pressure and epilepsy, so why wouldn’t we clue them in on another important area of their medical background with them? My prayer has always been that they will realize depression is no more embarrassing or shameful than having a physical disease like diabetes. Growing up, whenever those closest to me discussed a person that suffered from a mental illness it was always with a tone of pity and disgust, despite the widespread mental health issues that exist within my own family. Initially I kept my diagnosis a secret from everyone but my husband, fearing rejection or that it could somehow be used against me. After I did go public with my diagnosis, my news was met with a mixture of skepticism (“Are you sure you’re not overreacting? Could the doctor be wrong?”). The most resistance came from family members that obviously suffer from mental illness symptoms and would likely receive diagnoses similar to mine, should they ever seek help for them. I’ve chosen to be a cycle breaker by not hiding in the shadows of ignorance and fear of the truth about my condition, and although I still receive the occasional backhanded remark about my mental illness, I’m perfectly secure with myself and my reality. And here’s the thing: By being completely open with my children — and everyone else — about my mental illness, I’m normalizing bipolar disorder to the best of my ability. My kids have front row seats to view my ups and downs, and if they inherit some form of mental illness they will have realistic expectations of what life with its foibles and triumphs looks like. They understand that having a mental illness doesn’t prevent me from having a normal, happy, productive life, and that by taking care of myself in certain ways I can minimize the bad days. By continuing to set new goals for myself and achieve new things, like going from being a non-runner to finishing a marathon, I’m showing them that having a mental illness will only prevent them from pursuing their dreams if they let it. Encouraging them to discuss their feelings and validating their emotions has gone a long way in terms of showing them I accept them as they are. We talk about how they should handle things like anger and sadness, and I’m teaching them that although those feelings can be scary that they’re normal. They’ve accompanied me to checkups at my psychiatrist’s office. I want them to trust me and feel comfortable asking me for help if they ever need it, and one of my children has begun working with a therapist for some issues he’s experiencing. The fear of the unknown is a powerful thing, and letting them see the reality of treatment conquers that battle. We don’t hide these appointments from others; it’s just like going to the dentist except they don’t get stickers and new toothbrushes when it’s over. Preventative care is super-important in safeguarding against any kind of illness, and caring for our mental health is just as important as maintain our physical health. I’ve told them that I NEED to go to yoga to keep both my mind and my body healthy. When I practice at home, they join me sometimes and I praise them for taking good care of themselves. As much as I love baked goods, they know I choose to skip eating them because the gluten, found in the wheat flour that many of them contain, aggravates my bipolar disorder symptoms. Every Sunday they see me fill my pill organizer for the upcoming week with my pharmaceuticals and the health supplements I use to keep those symptoms at bay, and they’re generally around when I take those medicines each night. None of these all-too-important methods seem odd to them even though they understand the reasoning behind them because living with mental illness is normal life in my family. By living with me my kids have seen that even those of us who are mindful of staying mentally healthy still get sick sometimes. They understand that when depression rears its ugly head in my life that I’m sick, just as if I had the flu, and I’ve told them that some of us are just more likely to come down with sickness than others. I tell them when I’m not feeling well and ask them for extra patience and love. I don’t always get it, because, hello, they’re kids, but at least they understand that THEY are not CAUSING my sickness. My kids are learning to have compassion and understanding for those whose minds may work differently than their own and that all of us need kindness. We all have unique and irreplaceable value as individuals, and the world needs each of us. Showing children to see the person rather than their difference, will teach them to not fear mental illness and hopefully help them to accept any diagnoses they or a friend or loved one receive. Jessica Azar writes while raising four stair-step kids, known affectionately as The Herd, with her husband and college sweetheart in her Alabama hometown. She blogs at Herd Management and humorously details the adventures and mishaps of being a work-at-home-mom in addition to raising kids with a country lifestyle. She also happens to like yoga and single malt scotch a whole lot. Jessica co-edited a mental health anthology entitled Surviving Mental Illness Through Humor, and has had essays published in humor anthologies like Clash of the Couples, It's Really 10 Months; Special Delivery, and I Just Want to Be Perfect. 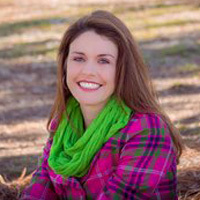 Look for her other published work on Redbook, Marie Claire, Country Living, xoJane, The Southern Weekend, elephant Journal, POPSUGAR, Huffington Post, Scary Mommy, NickMom.Com, Venn Magazine, BluntMoms and additional online locations.